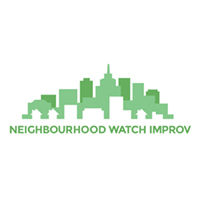 With six per­form­ers, The Neigh­bour­hood Watch is one of the larg­er improv troupes, giv­ing them more minds and bod­ies to cre­ate with. They ask for two audi­ence sug­ges­tions; a ​“fic­tion­al town” and a ​“com­mu­ni­ty event”, then pro­ceed to cre­ate a long form improv with three dif­fer­ent sto­ry lines impro­vised around these themes that they slow­ly inter­weave into one tale. The tran­si­tions were good and there were some fun­ny bits. I also found some per­form­ers to be notice­ably stronger than oth­er. This is a short, 45 minute show that was fun to watch but not over­ly fun­ny on the night I attend­ed. How­ev­er, this is improv and every show is dif­fer­ent so you nev­er know what you’ll get to see tomorrow.